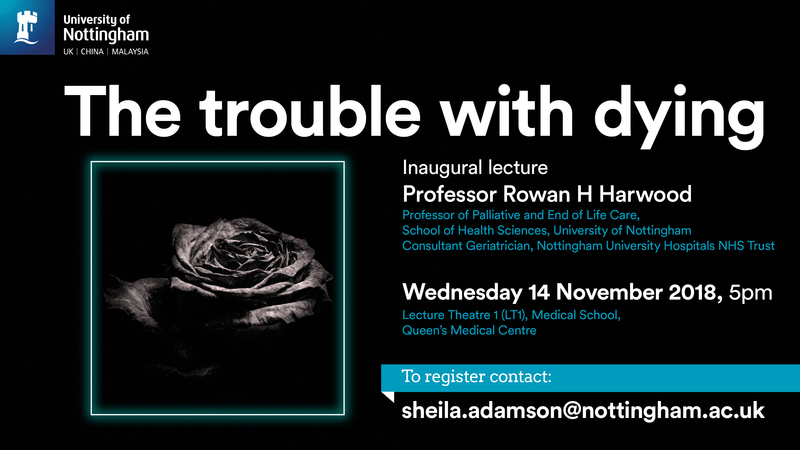 Professor Rowan H Harwood is a Professor of Palliative and End of Life Care at the University of Nottingham School of Health Sciences and Consultant Geriatrician at Nottingham University Hospitals NHS Trust. Most of us alive and well as adults can expect to live into our 90s. Much of the expertise in end of life care comes from looking after people dying from cancer, yet only 28% of us die from cancer. The way we die when we are very old has some similarities, but also many differences, from cancer deaths. A third of us will die with dementia, now the commonest certified cause of death in the UK. ‘Multimorbidity’ (having a lot of different diseases at once), frailty (vulnerability to crises), disability (restriction in activities), and social complexity all colour the picture. Planning and decision making are more difficult. Above all we need to cope with uncertainty – and how we make medical and social plans in the light of that uncertainty. The UK fares well in international comparisons of end of life care, based on strong palliative medicine and general practice. Death in old age most often occurs in care homes and hospitals, both of which can be challenging environments. Geriatric medicine – medical specialists in the care of older people – is the largest medical specialty in the UK, and draws on multiple approaches to care. Sometimes we need to use relatively aggressive medical means to overcome a life-threatening illness, but we are also concerned with restoring function (rehabilitation), dealing with mental health and cognitive problems, identifying those who are dying and helping them to a good death. Experience in improving care for people living with dementia, following the approach of ‘person centred care’, also holds lessons for end of life care. This focusses on valuing people, empathy, individualising care to meet their various needs and preferences, and the use of relationships to improve wellbeing. Medicine alone will not solve the ‘problem’ of dying, but dying will always be a part of practicing medicine. We have come a very long way in improving the experience of dying; to move forward requires clarity of understanding and purpose, openness to ideas and innovation, and a strong link between academic and bedside practice. 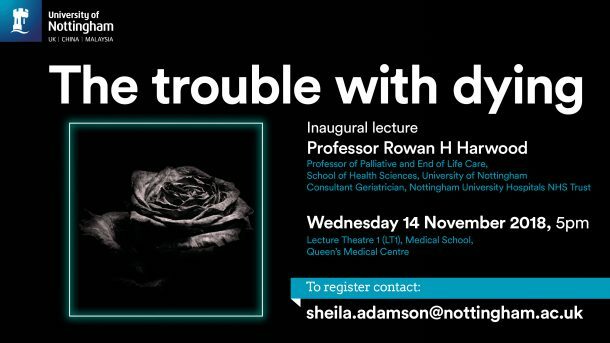 Professor Rowan H Harwood will be giving his inaugural lecture at the University of Nottingham on Wednesday 14 November at 5pm in Lecture Theatre 1 (LT1), Medical School, Queen’s Medical Centre. To register, contact sheila.adamson@nottingham.ac.uk.